When you start your web application in previous versions of visual studio and then stop debugging, the IIS Express would still remain running. By default in visual studio 2013, you would observe that when you run your web application, the Visual Studio debugger would start your web application in IIS Express. When you stop debugger, the IIS Express will be closed. How to Prevent Visual Studio 2013 from Closing IIS Express after Stopping Debugging? In the earlier versions of Visual Studio, the edit and continue feature is disabled by default for a new web application project. In Visual Studio 2013, this feature is enabled by default. 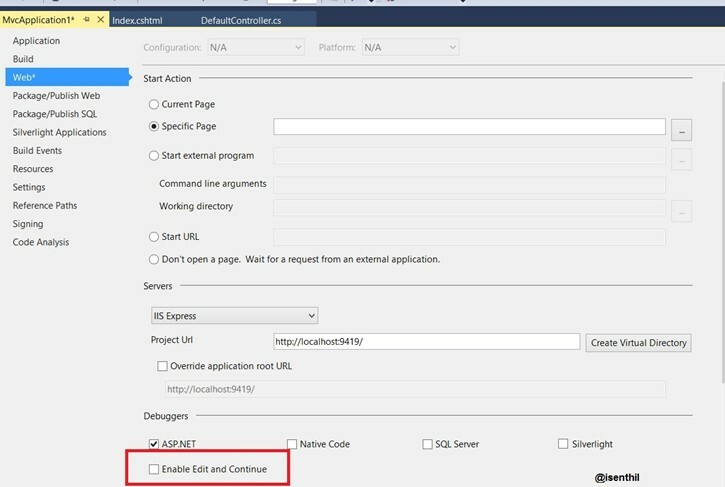 When “Enable edit and Continue” is enabled, you will see that the IIS Express will be shown by default within the system tray when you run your web application. This will be closed when your stop debugging the application.